Au Vélodrome remained in Metzinger's atelier until it was shipped to New York, where it was shown to the public for the first time, 8 March to 3 April, at the Third Exhibition of Contemporary French Art, Carstairs (Carroll) Gallery—with works by Pach, Gleizes, Picasso, de la Fresnaye, Van Gogh, Gauguin, Derain, Duchamp, Duchamp-Villon and Villon. On 10 February 1916 the American collector John Quinn acquired Au Vélodrome and the Racing Cyclist. Both works by Metzinger had been on view in the Carroll Galleries exhibition. The acquisition was preceded by a lively correspondence between Quinn, the gallery manager Harriet Bryant, and the artist's brother Maurice Metzinger. In 1927 an exhibition and sale of Quinn's art collection took place in New York City. The sale was conducted by Otto Bernet and Hiram H. Parke at the American Art Galleries. A catalogue was published for the occasion by the American Art Association. Au Vélodrome (n. 266 of the catalogue) was purchased at the sale for $70 by American art dealer and publisher J. B. Neumann. Peggy Guggenheim purchased the painting from Neumann in 1945 and forms part of the permanent collection of her museum in Venice; Peggy Guggenheim Collection. From 9 June to 16 September 2012 the painting was the subject of an exhibition in Venice entitled Cycling, Cubo‐Futurism and the 4th Dimension. Jean Metzinger’s "At the Cycle‐Race Track". 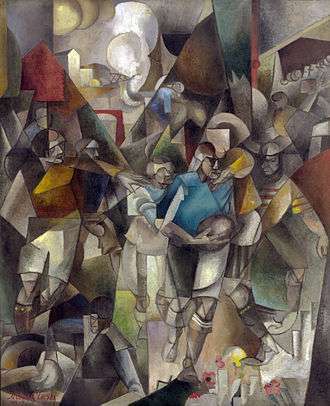 At the Cycle-Race Track (Au Vélodrome), is an oil, sand and collage on canvas, painted in a vertical format with dimensions 130.4 × 97.1 cm (51 3/8 × 38 1/4 in), signed JMetzinger towards the lower left. In the foreground a road bicycle racer is shown in various degrees of transparency that give way to elements of the background, blurring the distinction between distances near and far. The cyclists head, for example, is almost entirely transparent, the audience composed of mosaic-like cubes is visible through the head, neck and arm, an effect reminiscent of the artists Divisionist period. Metzinger's bicycle shimmers between the unique and the multiple, as if the two merge into one. The scene represents an extant photo-finish, a series of frames captured during the final sprint at the end of a race. The presence of the other bicyclist is revealed by the rear wheel to the left of the canvas. Metzinger's painting appears to show the handlebars in two positions, but the handlebars along with sections of the bicycle frame are actually superimposed as a transparency (over the left hand, left foot of the cyclist and over the drive-wheel), representing two consecutive frames, one subtracted from the other, i.e., the road is visible 'through' the racer where the bicycle had been a fraction of a second earlier, as if to show motion through absence. With this type of game playing with contradictory visual codes (positive and negative space), Metzinger discerns the past and the present infinitesimally separated in time; while the perception of the future is left to the intellectual discretion of the observer to contemplate. Cubist and Futurist devices appear superimposed in Metzinger's At the Cycle-Race Track, creating an image that is readable yet essentially anti-naturalistic. Cubist elements include the reduction of the geometric schema to simplified shapes, and the juxtaposition of rotating planes to define spatial qualities, printed-paper collage, the incorporation of a granular surface and multiple perspective. Parallels with Futurism include the choice of a subject in motion (the bicyclist), the suggestion of velocity (motion blur on the wheel spokes), and the fusing of forms in a static picture plane. Metzingers's work integrates the idea of an aesthetic generated by the modern myth of the machine and speed. 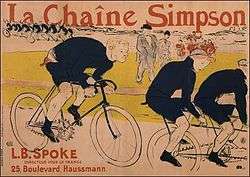 At the Cycle‐Race Track illustrates the final yards of the Paris–Roubaix race, and portrays Charles Crupelandt, the 1912 winner, according to the art historian Erasmus Weddigen. The race is known for its extreme difficulty and danger of cycling over the narrow cobblestone roads of northern France. The Paris–Roubaix has since been referred to as the Hell of the North (L'enfer du Nord), and A Sunday in Hell. Metzinger’s painting was the first in Modernist art to represent a specific sporting event and its champion. He incorporated into the painting his concepts of multiple perspective, simultaneity, and time, according to his belief that the fourth dimension was crucial to the new art that could compete with the classical French tradition. We would often cross the broad avenue with the martial sounding name... The one that separated Courbevoie from Puteaux. It was in the peaceful garden of that welcoming household only a few years before the terrible year of 1914 that forms were born that, 50 years later, one would still think were new! We returned there often and soon we were spending our Sunday afternoons not merely conversing about aesthetic novelties but rather kicking a ball around or indulging in a spot of archery. In 2012, one hundred years after it was painted, Metzinger's Vélodrome was showcased in an exhibition entitled Cycling, Cubo‐Futurism and the 4th Dimension. Jean Metzinger’s "At the Cycle‐Race Track", at the Peggy Guggenheim Collection in Venice, Italy. The painting is one of the pivotal Cubist works at the Peggy Guggenheim Collection. 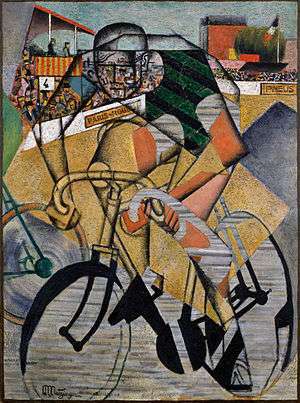 The exhibition, curated by Erasmus Weddigen, brought together two other paintings and a drawing by Metzinger treating the same theme, in addition to several other paintings on the theme of cycling. Just as Metzinger’s painting, the show combines a passion for the sport of cycle‐racing with an investigation into the nature of the Fourth dimension in art; a topic much discussed in Metzinger’s immediate circle and alluded to in the number 4 visible in the stadium grandstand in the upper left quadrant of the painting. Vintage racing bikes at the exhibition included one owned by Albert Einstein. 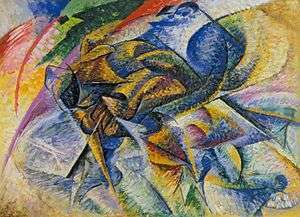 The theoretical and sporting themes of the show were designed to illustrate theories of space and time formulated by Einstein and multiple perspective developed independently by the Cubists, and most notably by Metzinger, as early as 1910. 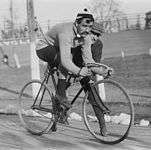 1913, Charles Crupelandt, a French professional road bicycle racer who won stages in the 1910, 1911 and 1912 Tour de France. 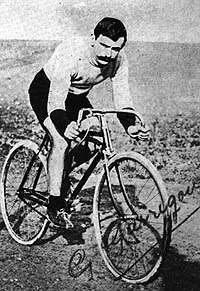 His biggest successes were the 1912 and 1914 Paris–Roubaix. Guillaume Apollinaire, "Les Peintres Cubistes" (The Cubist Painters) published in 1913, (translated and analyzed by Peter F. Read, University of California Press, 25 oct. 2004 - 234 pages).